I always found girls and ladies with eyes of varied colour (other than black) very attractive. I used to wonder why people would call them "Poona Kannu" or "Poocha Kannu" as though having those eyes was taboo. Anyway here is an unusual pic. 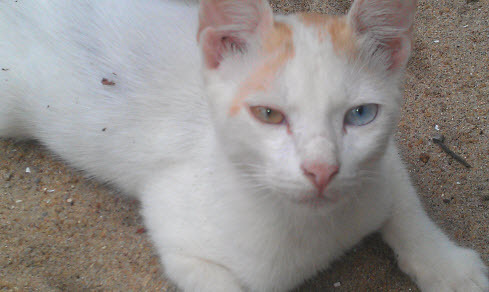 I took this picture of a very playful kitten with unusually differently coloured eyes at my friend's house in Kara, (near Kodungalloor), Kerala last November. Looks as though it is using a differently coloured lens in one of the eyes but obviously it isn't. One eye is of a yellow colour whereas the other is a pure grey with a tinge of blue. Click on the pic to view a bigger image. One may even think looking at the pic if the right eye of the cat (yellow coloured eye) was hurt or diseased but it is not so. The kitten is perfectly normal. In fact it was as playful as a puppy. The camera caught the kitten closing up the eye a bit smaller than the other, the instant the picture was taken. Already cats have eyes that scare me and this one is even strange. Have you even been stared at by a cat. Gosh, they fix you with their fierce gaze.